Marlborough airline Sounds Air could pick up the slack after the national carrier announced it was ending flights between Blenheim and Christchurch. Air New Zealand announced on Monday it was pulling out of its Blenheim-Christchurch and Auckland-Whanganui routes because of a lack of demand. Sounds Air managing director Andrew Crawford said the privately-owned airline was exploring taking up the Blenheim-Christchurch route, which he said would operate at least twice daily. The airline, which had a fleet of Cessna Caravans and Pilatus PC12s, had taken over other regional routes abandoned by Air New Zealand, including those between Westport and Taupo to Wellington. Marlborough Mayor Alistair Sowman said he was disappointed and frustrated by the national carrier's decision. "Now that Air New Zealand has left this vacuum I would anticipate our successful local operator Sounds Air might see the opportunity here so let's wait and see what happens," he said. An Air New Zealand spokesperson said when the direct service ended on July 31, the quickest flight time via Wellington would be 90 minutes and the cheapest fare would remain the same at $59. The reason the airline pulled the routes was because of a lack of demand, however it had been criticised for not waiting longer to see if demand would pick up on its larger planes. The Blenheim-Christchurch route had been serviced by Beechcraft 1900D aircraft, however these were replaced by 50-seater Bombardier Q300s in early May. Marlborough Airport chief executive Dean Heiford said he was disappointed the carrier had made the announcement so soon after switching to the larger planes. "I'm disappointed they didn't give us a bit more of a chance to build capacity, but I understand it's an economic decision," he said. The spokeswoman said the 50-seat services had been available to book for more than a year and the airline had dropped lead-in fare prices by 40 per cent to reflect the increased capacity. But there had only been an increase of around two to three people per day, she said. "Forward bookings on this route are not strong enough to sustain a viable service." Staff at PC Media, in Blenheim, used the service at least once a week for business. Technical director Lee Harper said the airline had not waited long enough to see if demand would pick up. "It was three weeks in the middle of winter with barely any promotion," he said. The times for business people travelling from Blenheim were good, but hardly anyone used the 6.10am departure time from Christchurch, he said. It would be too difficult to get from Blenheim to Christchurch via Wellington by 9am, so Harper said staff would have to drive and stay overnight in the city. Marlborough Tour Company managing director Chris Godsiff said the flight schedule had contributed to the lack of demand which caused the service to close. "The flights that Air New Zealand put on weren't particularly user-friendly, they were pretty cranky times," he said. International visitors coming to Blenheim might be put off by having to get two flights, he said. "It's got to be a deterrent, because the last thing you want to do when you get to New Zealand is get another two flights, one is bad enough." Sowman said the timing of the announcement was frustrating because the top of the South was expecting more Chinese visitors. Destination Marlborough general manager Tracy Johnston said the news was disappointing but around 80 per cent of international visitors arrived in New Zealand through Auckland Airport. Blenheim had good connectivity with Auckland, so she did not think cutting the Blenheim-Christchurch link would impact the number of overseas tourists coming to Marlborough. Go on Andrew... you guys can make it work. PC-12 is the machine with a realistic timetable and your fair fares! Air Chathams is stepping into the gap left by Air New Zealand pulling out of Whanganui... Whanganui mayor Annette Main said the loss of the route would have been a major blow but, fortunately, Air Chathams had already stepped into the gap. Air Chathams announced, almost simultaneously to Air New Zealand's announcement, they will be starting flights between Auckland and Whanganui as soon as Air New Zealand stops its service to the airport on July 31. Their 19-seat Metroliner planes will fly the same weekday schedule as Air New Zealand currently does, but there will be some minor changes to weekend flights. Whanganui MP Chester Borrows found it encouraging that Air Chathams had made a decision to take over the route. He said people wouldn't like Air New Zealand's decision but the best option was to move on. 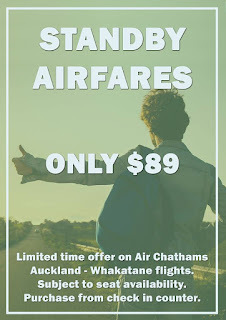 "We can sulk about this and get no change, or shake the living daylight out of the opportunity we have to prove them wrong"... Main said the council looked forward to welcoming Air Chathams to the Whanganui Airport, and would be mounting a campaign to encourage the community to support the route. Air Chathams chief executive Craig Emeny said he was encouraged by the resolve shown by Whanganui's elected representatives to support the Auckland-Whanganui service. "We understand the commercial decisions that have prompted this decision from Air New Zealand. "And we want to reassure the local community that Air Chathams will continue to work alongside the national carrier to ensure that Whanganui receives a safe, reliable air service enabling the region to continue to grow into the future." A lack of demand is forcing Air New Zealand to end regional flights between Auckland and Whanganui, and between Christchurch and Blenheim. 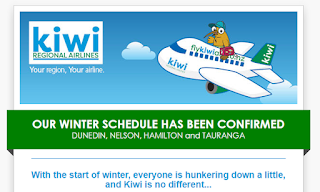 The national carrier said on Monday that both loss-making routes would stop from July 31 as "unfortunately ... [these] services do not have sufficient passenger demand to sustain a 50-seat aircraft service, despite the continued efforts of Air New Zealand and local stakeholders". In November 2014 Air New Zealand said it would retire its loss-making 19-seat Beech aircraft fleet in favour of the larger and more economically viable 50-seat Q300 aircraft in regional centres where if felt there was enough demand. While some regional routes were cancelled then, the airline noted on Monday that, over the past year, it had added nearly 250,000 extra seats to regional services and would add another 400,000 in the next year. General manager of networks, Richard Thomson, said Air New Zealand looked closely at the Whanganui – Auckland service when the regional network was reviewed in 2014. "While the service was marginal at that time we believed it was worth taking a chance on Whanganui and working with the local community in an effort to stimulate demand. "Unfortunately the market dynamics have changed markedly since then as a result of competition entering nearby Palmerston North just 70 kilometres away. The greater number of destinations, higher frequency of service and wider range of connecting options on offer at the neighbouring airport have unfortunately served to undermine demand for Whanganui services and we've seen customers effectively voting with their feet and using Palmerston North rather than Whanganui Airport. "Despite almost halving the average fare on this route we've been unable to create sufficient additional passenger volume to sustain an ongoing service and unfortunately this means we will cease operating to Whanganui." Air New Zealand said while the Christchurch-Blenheim service would also end, it planned to boosts seats between Blenheim and Auckland and Wellington. Customers booked to travel on suspended services past July 31 would be able to get a refund or choose a different airport to fly from. In November 2014 Air New Zealand announced it would move to progressively retire its loss making 19 seat Beech aircraft fleet and move to operating the larger and more economically viable 50 seat Q300 aircraft in regional centres where demand was sufficient to support more sustainable regional services. At this time it was also announced the airline would suspend a small number of regional routes which were not viable and would work closely with other regional centres to stimulate demand to support the additional capacity offered by the larger aircraft. Since this time Air New Zealand has invested significantly in regional New Zealand. In November last year the airline announced it would invest in 15 new 68 seat ATR turbo-prop aircraft valued at around $600 million. This investment was in addition to 14 new ATRs already committed to. Air New Zealand has also recently completed a $1 million interior refurbishment of its Q300 fleet, and a $100 million lounge programme is currently underway which includes significant investment in the upgrading of regional lounges. Over the past 12 months alone the airline has added nearly 250,000 extra seats to regional services across New Zealand and will add another 400,000 over the coming 12 months. Air New Zealand operated almost six million seats to regional New Zealand ports in FY16. The majority of regional markets have responded very positively to the changes, for example on the Auckland – Kerikeri route passenger demand has increased close to 15%. In FY16 the airline operated 21,000 more seats to and from Kerikeri than in the previous financial year. Between Auckland and Rotorua Air New Zealand operated 15,000 additional seats in FY16 compared with the previous year and passenger demand has increased by 15% in response. Unfortunately the loss making Whanganui – Auckland and Blenheim – Christchurch services do not have sufficient passenger demand to sustain a 50 seat aircraft service, despite the continued efforts of Air New Zealand and local stakeholders. Air New Zealand has made the decision to suspend these services on 31 July this year. General Manager of Networks, Richard Thomson, says Air New Zealand looked closely at the Whanganui – Auckland service when the regional network was reviewed in 2014. “While the service was marginal at that time we believed it was worth taking a chance on Whanganui and working with the local community in an effort to stimulate demand. “Unfortunately the market dynamics have changed markedly since then as a result of competition entering nearby Palmerston North just 70 kilometres away. The greater number of destinations, higher frequency of service and wider range of connecting options on offer at the neighbouring airport have unfortunately served to undermine demand for Whanganui services and we’ve seen customers effectively voting with their feet and using Palmerston North rather than Whanganui Airport. “Despite almost halving the average fare on this route we’ve been unable to create sufficient additional passenger volume to sustain an ongoing service and unfortunately this means we will cease operating to Whanganui.” Air New Zealand will also suspend its loss making service between Blenheim and Christchurch from 31 July, as a result of insufficient demand. Blenheim’s services to Auckland and Wellington however will be strengthened in the coming year, with increased frequency and 35,000 additional seats in FY17. Air New Zealand is making some adjustments to its regional flight schedules reflecting recent feedback from local stakeholders and to meet growing demand on a number of routes. 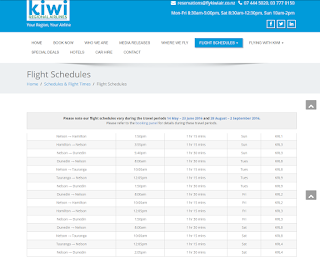 Earlier this year the airline introduced a revised domestic schedule, taking effect progressively throughout 2016, aimed at enhancing the customer experience for Kiwis and visitors to New Zealand by delivering improved connectivity to domestic and international services and more consistent weekday departure times, particularly for peak morning and early evening business travelers. Air New Zealand General Manager Networks Richard Thomson says the airline is committed to operating a comprehensive domestic schedule delivering connectivity and consistency while also meeting the key needs of each community. “The new schedules have been generally well received by customers, although a couple of communities raised concerns around new peak business flight timings. “A strength of our business is the emphasis we place on consultation and responding to customer feedback. While the response to the new schedule was very positive we have listened carefully to stakeholder and customer feedback and we’re pleased to have been able to overcome some key challenges identified in the following communities”. From 30 October, the first flight of the day from Whangarei to Auckland (Monday-Saturday) will be retimed to depart at 7.10am – 45 minutes earlier than originally proposed. The new 7.10am service will be available for booking from early June. From 30 October, the first flight from Kerikeri to Auckland will depart on weekdays at 6.00am. This will be achieved by continuing to overnight an aircraft in Kerikeri to enable the early morning departure. Kerikeri is one of the routes benefiting from the replacement of the 19 seat Beech fleet with the larger 50 seat Q300 aircraft, which has allowed the airline to offer customers more lower priced fares. Air New Zealand will operate an additional 10,000 seats between Kerikeri and Auckland in FY17. Air New Zealand will reinstate an early morning service, departing from Tauranga to Christchurch at 6.05am, and will operate up to 10 new weekly services between Auckland and Tauranga. This is a significant regional growth market and the airline will operate up to 80,000 additional seats to and from Tauranga during FY17. 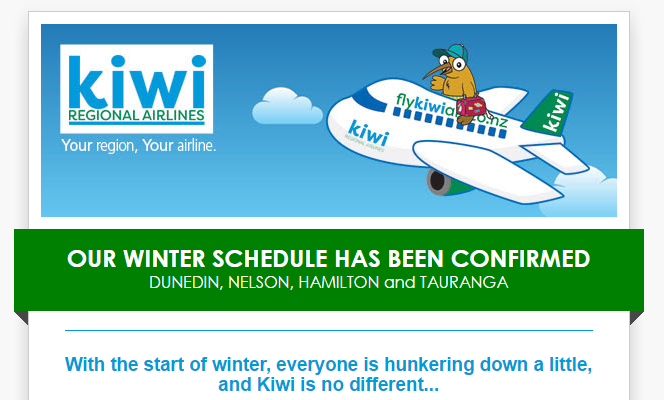 Kiwi Regional's Facebook page has announced confirmation of their winter schedule. The airline will be operating 4 times a week between Nelson and Dunedin on Sundays, Tuesdays, Fridays and Saturdays, twice a week between Nelson and Hamilton (or Dunedin and Hamilton via Nelson) on Sundays and Fridays and twice a week between Tauranga and Nelson (or Tauranga and Dunedin) on Tuesdays and Saturdays. Yet another PC-12 for Sounds Air??? The comment is what interests me most... "Two of the PC12s Flinders Aviation painted for Sounds Air. Number 3 arriving the 15th of next month." Well PLS was certainly in the country on Thursday as I sighted at Wellington.... I don't think PLZ has skipped the country so is there yet another PC-12 on the way? As an aside it is no longer possible to just wander down to the satellite terminal in Wellington anymore. This is most frustrating as I used to get some good pics down there! Kiwi Regional Airlines staff are mending fences with passengers after a small mechanical fault on Sunday led to a four-day wait for a replacement part for their only plane. The SAAB340A plane was grounded in Dunedin on Sunday after the engine fault grounded the scheduled 11am flight to Hamilton via Nelson. The replacement part had to be sourced from Australia, however due to the supplier being unable to provide the part, the search for an alternative took them to the United States. An anticipated two day delay extended to yesterday morning when service was finally resumed. A total of 250 passengers on 12 scheduled flights were affected. Some customers, including several from Nelson, expressed their frustrations to the airline directly or through social media at loss of the service. One Nelson woman, who did not want to be named, said the airline had not been helpful finding alternative flights. Kiwi Regional's reservations manager Dave MacPherson said it took "three days to get the part, one hour to inspect it and half an hour to fit it". MacPherson said the airline had sought to offer assistance in the wake of the cancellations with offices staying open until 11pm on most evenings to offer refunds or coordinate alternative transport. However, he appreciated that given the situation some passengers had fallen through the cracks or made their own arrangements. "There are things we could have done a bit better and certainly we will take plenty out of this," said MacPherson. "Obviously making people get off in the freezing rain (in Dunedin) isn't ideal and with a bitter southerly to battle against some passengers didn't hang around – we want to help those people. He added that Kiwi Regional was continuing to track down the few remaining passengers affected, and stressed that anyone who had not already done so should get in touch so that they could resolve their issue directly or discuss possible reimbursement. The idea of raising $2 million for additional aircraft through a crowdfunded shareholder initiative remained a long-term objective, although the legislative side of things was still to be finalised. "It is still on the cards but I can't see it happening in the next month," said MacPherson. The problems of having one plane also surfaced in February, when the airline cancelled flights after grounding the aircraft for unscheduled maintenance. Did the Door Really Open? Passengers on board a domestic flight from Kaitaia to Auckland were "bloody scared" when the aircraft's door opened mid-flight while flying through rough weather. Passenger James Snowden told ONE News six people and a pilot boarded the Barrier Air Piper Chieftain plane in Kaitaia about 4.30pm yesterday before it left for Auckland with a scheduled stop in Whangarei. "When we jumped on the ground, crew in Kaitaia had trouble closing the door. I could see a slightly concerned look on his face, but [he] shut it anyway and had no problems even though it was a bit bumpy to Whangarei," he said. After landing in Whangarei he said the pilot informed the remaining four passengers he had no ground crew and needed to close the door from Mr Snowden's seat at the back of the plane. "I asked, 'are you sure that door is shut?' Due to my earlier concerns in Kaitaia. He said, 'no problem'." "We left Whangarei without a hitch, apart from it was very bumpy," Mr Snowden added, before the flight ran into trouble near Auckland. "We must have been over Whangaparaoa when a whole lot of air started coming from the door and it got very loud, I said 'oi' to the pilot as it got louder, he said 'it was to release pressure', but it was an unpressurised plane." Mr Snowden said the aircraft circled over Auckland Airport for what felt like "three times". "The pilot asked how the door looked, we said 'okay', but [we] don't know what it's supposed to look like." It was bloody scary." After landing safely in Auckland, Mr Snowden said the pilot opened the door but before doing so "noticed the red handle [was] up which he had previously put down". He said the pilot was then seen on his haunches by the wing of the plane "breathing very deeply". Mr Snowden added the pilot had earlier mentioned the plane's door had recently been repaired. "There was nothing more mentioned, no explanation or apology. After having time to think, if that door had opened fully it would have torn the tail off with me in it! "It was bloody scary." Another passenger on board the flight confirmed to ONE News the door had opened mid-air. "Not fully but enough to cause concern," he said. "I would also say the pilot did a great job and the weather was fairly rough." Barrier Air has declined to comment when approached by ONE News, while the Civil Aviation Authority said such incidents are required to be reported within two weeks. The seven to eight seater Piper Chieftain aircraft is described on the Barrier Air website as the fastest plane it operates, is "quick and comfortable", and "perfect for Barrier Air's Kaitaia-Auckland service". Barrier Air took over flying to Kaitaia from Air New Zealand on April 28, 2015. Engineers have inspected and tested a Barrier Air aircraft after its door opened mid-flight while flying to Auckland. The Piper Chieftain plane left Kaitaia for Whangarei about 4.30pm on Tuesday with six passengers and the pilot aboard, before it then completed a flight from Whangarei to Auckland in "rough weather" with five passengers. However, as the aircraft approached Auckland Airport its single door opened, alarming those on the flight. "We must have been over Whangaparaoa when a whole lot of air started coming from the door and it got very loud," passenger James Snowden told ONE News. Another passenger on board the flight also told ONE News the door had opened mid-air. "Not fully but enough to cause concern," said the passenger, who asked not to be named. "I would also say the pilot did a great job and the weather was fairly rough." 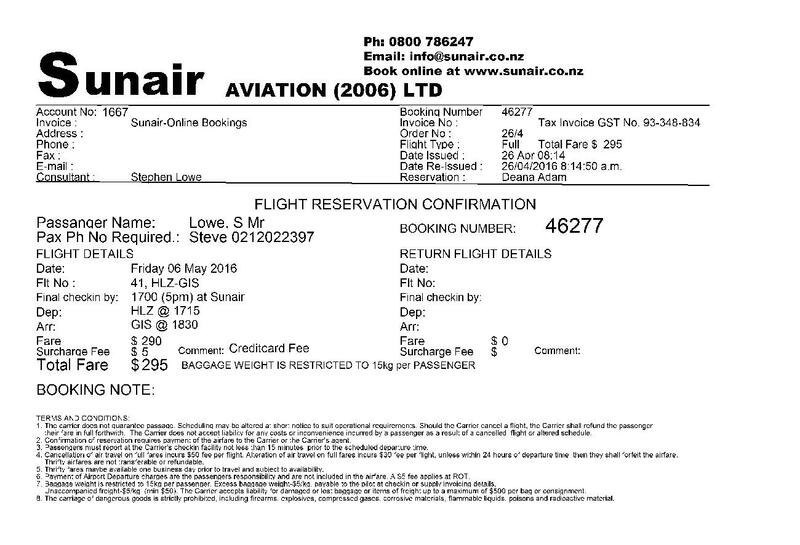 Mr Snowden said, after the aircraft landed in Auckland, the pilot opened the door but before doing so "noticed the red handle [was] up which he had previously put down". The seven to eight seater Piper Chieftain aircraft is described on the Barrier Air website as the fastest plane it operates, is "quick and comfortable", and "perfect for Barrier Air's Kaitaia-Auckland service". Barrier Air took over flying to Kaitaia from Air New Zealand on April 28, 2015. The story about the Barrier Air plane door opening mid-flight brings back memories for Winsome Mitchell of Whakatane. "In 2011, our family was holidaying in Alaska. We had hired a local charter company with a small Beaver floatplane to go bear spotting when our pilot spied a pod of orca below and began low circling to give us a clearer view. The passenger door beside my husband suddenly came open and our quick-thinking grandson leaned across and pulled it shut. We landed in a small bay where there were several bears on the shore. But every time anyone tried to tell the pilot about the door, he put his finger to his lips, pointed to the bears and said, "Sssh." When we landed I told the pilot what had happened. His response blew me away. "The plane door came open when we were flying and you didn't even cry? Man, you Kiwis are tough!" If you'll excuse the hoary pun, things are taking off at Whanganui Airport. Not so much because Air New Zealand is flying 50-seater planes through our regional hub, but rather that other things are happening or are about to happen at the airport, all aimed at underpinning the economic well-being of the facility. Allan MacGibbon, airport manager, tracks passengers going through the airport gates to board Air NZ flights. He said allowing for a 65-70 per cent loading on the 50-seater Q300 planes, which were flying up and back three times a day, about 60,000 people were using the service each year. But that scenario will change in March next year when the airline reverts to two daily flights - two out and two back. "It doesn't help because effectively it means the flights will only service the Whanganui market - those flying out of the city - rather than the Aucklanders wanting to come here for a day's business. And I'm alarmed with that call because it changes the dynamics at our airport dramatically." Mr MacGibbon said at the moment the 10am flight from Auckland was showing good passenger loadings and most of them were "suits" (business people) but the pending change would affect that. He said that was the problem the airline had with the Whanganui to Wellington service because it was only good for those flying from here to Wellington with a flight leaving in the morning and returning that night. But the other issue for the Whanganui operation was the ongoing leakage of potential customers who use Palmerston North, an airport serviced by more planes and flying to more destinations. "We're relying on these (Whanganui) flights for our income because Air NZ is our biggest customer by far in terms of landing fees. "We work as well as we can with them to make sure they get everything they need here. And they appear to be more than happy with what we're doing," Mr MacGibbon said. He said Air NZ's schedule changes reflected the competition it was responding to in other parts of the domestic market from the likes of Jetstar: "It's just that Whanganui's at the bottom of the list." But he said there were some obvious positives happening at Whanganui's airport, and one of those was the pilot training school that was to set up here before the end of the year. "The sky's the limit really in how big that becomes. It only depends on how much money you want to pour into it," Mr MacGibbon said. The school gets government funding for 14 New Zealand student pilots. The rest will be privately funded and most of those are from overseas. But it could be that more than 40 students are enrolled at any one time. "But there's potential to grow if they're looking at the international market." So while the national carrier is the biggest customer, it's not the only one. The airport is a busy place with agricultural planes, the aero club, Air Wanganui and more recently the RNZAF contributing the income. "The Air Force is using its Texan trainer aircraft for a lot of touch-and-go landings. And we've had indications from the Air Force they'll be using our airfield a lot more," he said. "They need to get their pilots into different places as they learned to fly in different environments. The King Airs fly here and the NH90s and Agusta 109 helicopters. It's very convenient for them because we're only 10 minutes away from Ohakea. "They pay the same for a touch-and-go as they would if they landed. But if they do 10 touch-and-goes, we'll only charge them as if it was one landing. That's the same as we charge others." For the airport it represented revenue but Mr MacGibbon said Whanganui's charges were in the lower quartile. "We're between a rock and a hard place. We don't want to raise charges to drive people away but equally the ratepayers shouldn't be subsidising someone's flying, so it's about striking a balance." Whanganui Airport is a busy regional airport and on a typical day racks up between 30 to 50 movements. That includes Air NZ, agricultural aircraft, the air ambulance and aero club flights. It's a 50/50 partnership between the city and the Crown, one of six left in the country working under that arrangement. While he's promoting the airport, Mr MacGibbon has been a prime mover behind the idea of an aviation network servicing the country. "We've got a roading network which everyone accepts as vital but for some unknown reason we haven't done the same for the aviation industry. But we're working to get this changed. "Whether you're a small or large airport, it essentially doesn't change what you are. It depends on the ownership model and in our case we've had outstanding support from the district council. Look at the medical flights going from here. Without Air Wanganui's service there are a lot of people who wouldn't be alive today." He said airports were often taken for granted but there was a considerable financial commitment made to the operation of the facility. Next year, for example, they would spend $250,000 on a protective sealing coat over the runway. "Whether we're going to be a major scheduled passenger airport into the future, I don't know. We're so close to Palmerston North. But in terms of driving the local economy, our airport is absolutely vital. "And I think we're going to see more third-level carriers emerge as well. Companies like Air Chathams and Sounds Air might start getting involved again in smaller centres. "But without that passenger link to Auckland especially I think this would be a different place. Whether we can sustain it into the future and whether we've got a carrier committed to providing the service is another thing. But we've proved that we can support that network. "The numbers through here are pretty good and it's convenient but I'm just a bit concerned that their plans do not include a service that suits people flying from Auckland to Whanganui. "That said, we value Air NZ and try and provide the best damn service to them that we can," Mr MacGibbon said. It has been nearly one year since Sounds Air began flying between Taupo and Wellington and the service is still going strong. Sounds Air took over the Taupo to Wellington flight service after Air New Zealand pulled its flights in April 2015. Taupo District Council signed a six year deal with the Marlborough-based air operator for them to provide three return flights each week day and two return flights on Saturdays and Sundays. The council guaranteed the first three seats in each flight meaning if they were empty ratepayers would pick up the tab. To date council has not had to purchase a single seat. "It was a bit slow to start," Sounds Air Managing Director and co-owner Andrew Crawford said. "We have been finding now it has been picking up. It takes a while for customers to move to something different." While it might be some time off yet Crawford said they would be looking at expanding their Taupo to Wellington service in the future. "The only change we would make is to increase it," he said. "We're watching it pretty closely." One thing that is definitely ruled out will up will be adding a larger aircraft on the route. "If Air New Zealand couldn't get it to work we won't be able to," Crawford said. Mayor David Trewavas was the first passenger on the flight 12 months ago and said the service has been vital for Taupo business. "When Air New Zealand pulled out the business community rallied behind and said they need a flight to Wellington," he said. "The other alternative was to go from Rotorua but then you have to have 2.5 hours of dead time. "The flight from Taupo takes just 45 minutes." Trewavas uses the flight often. It wasn't a particularly nice day to day at Paraparaumu but the sun was out was to photograph air2there's Cessna 208 Grand Caravan which had just arrived from Nelson. Air Rarotonga has acquired a Cessna Citation business jet to expand air charter operations both within the Cook Islands and to neighbouring Pacific Island countries. The aircraft seats up to eight passengers and can reach the Northern Group islands, Tahiti or Niue direct from Rarotonga in less than two hours flight time. It is fitted with a gravel kit for operation onto unpaved runways. It is presently in Sydney at the Citation Service Centre undergoing maintenance and modifications prior to delivery. The expanded air charter operation will be operated under the trade name of Pacific Private Jet with long time Air Rarotonga executive Teariki Numanga heading up sales and operations for the venture. 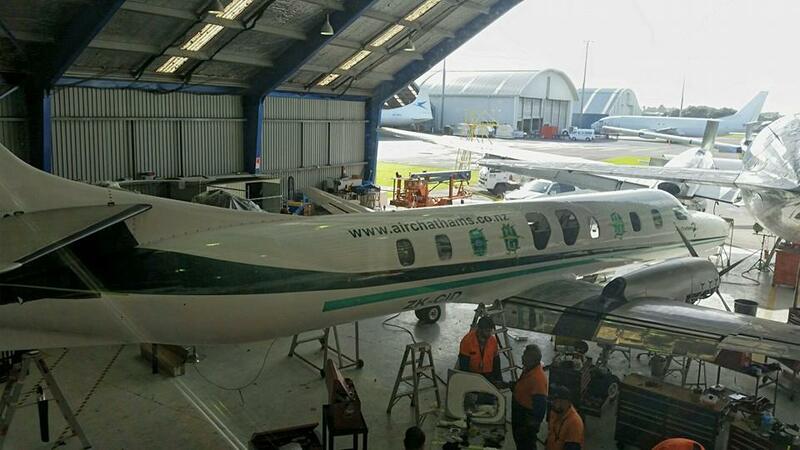 An application for licensing of the new aircraft has been made to the Cook Islands Ministry of Transport. 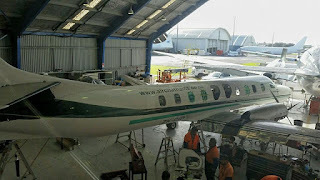 The Citation will be delivered to Rarotonga in August and will come with the additional equipment to undertake medevac flights within the region and to New Zealand. Air Rarotonga Managing Director said “ the ability to operate charter over long sectors around the region at jet speeds will be a real game changer for us. As well, a fully equipped air ambulance with the ability to get through to Auckland is the realisation of a long held ambition we have had”. Company pilots and engineering personnel will be undertaking training in the USA and Australia prior to flying the aircraft to Rarotonga for entry into service. It's been a while since I wrote my thoughts on what's going on in the regional scene. The news that Kerikeri and Whangarei are losing overnighting flights has prompted me to think somewhat about these centres. The news that Kerikeri and Whangarei are loosing their overnight Air New Zealand services meaning a later departure from the Northland centres to Auckland and with earlier late evening return services is a major blow to Northland business traffic. One wonders what Air New Zealand's motivation is. Perhaps it is the saving of not having to pay overnight accommodation for the crews? Or perhaps the Q300s are being deployed elsewhere to battle Jetstar. Whatever the reasons Air New Zealand seems to be going back to a Friendship-days mentality of providing services to the provinces when they have got aircraft spare. They have already cut services to Westport, Whakatane and Kaitaia and links between Auckland and Hamilton and Taupo and Wellington following the earlier withdrawal from Masterton, Wanaka and Oamaru. With the replacement of the Beech 1900s with Q300s Hokitika and Taupo have lost their overnight services and Timaru has a less than adequate service for early morning flights into South Canterbury with a late afternoon return. 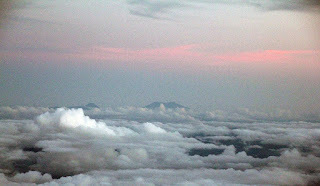 The tragedy in my opinion was all the work that Eagle Air and Air Nelson did to develop these routes has been lost. In saying that Westport seems more than happy with their Sounds Air service. From my observation the Taupo run seems a bit slower on the uptake but anyone who does use it loves it. Whakatane love their Air Chathams service and as has been reported their is the possibility of a Wellington service. Certainly both Whakatane and Westport have owned their new airlines and both airlines care about the communities they serve. It becomes then a mutual win win for town and airlines. Barrier Air have had a harder job on the Kaitaia run but it seems to have bedded down a lot better with two flights a day operating to Auckland, albeit one operating via Whangarei. Sadly for Barrier the new Air New Zealand schedule from November will have a Q300 almost replicating their new Auckland-Whangarei service. One wonders then if some of the regional airlines can actually do a much better job. I really do think Air New Zealand should think about doing some interline agreements with them - even just for baggage and late connections. People are flying the regionals and if their passengers fly to a major centre they then have a choice of airline to connect with... Why fly Air New Zealand when they offer nothing to encourage people to connect with their services? One wonders if there is room for a regional airline to pick up early morning services from Kerikeri to Auckland (the return of Salt Air? ), from Taupo to Auckland (the return of Taupo Air Services?) from Hokitika or Greymouth to Wellington (the return of Air West Coast?). I still think Masterton-Auckland is a possibility as well as Oamaru-Wellington. Perhaps an airline with an Aero Commander 690 could test the market before putting a Metroliner on the market? Before I leave Air NZ the Hamilton-Palmerston North will reduce to one flight a day from late August BUT is back to two flights a day from November! On other fronts, Kiwi Regional keep trucking up and down the country. Their plan had been to go daily by now but they are staying with a five day a week schedule. This was probably quite wise. In the end it seems to me that there is not a lot of room for them to move without tackling Air New Zealand. All remains quiet on the Originair front. I would have thought that the Nelson-Palmerston North would be a good fit for Sounds Air or Air2there but there have been no moves in that direction. Barrier Air is still offering some Hamilton-Auckland services. I want to try this service at some point (especially if the Partenavia is doing the run) but the schedule is not great. I think Barrier Air needs to really do its homework as to who that service is for and really target advertising accordingly. And speaking of advertising - Sunair. I love seeing what Sunair is doing. They have a fairly solid service between Gisborne, the Bay of Plenty and Hamilton with one or two flights operating most days. Sunair aren't cheap (though they have daily specials) and they fly when they have traffic. But they save a huge drive especially if people are doing a day return trip and this is the niche market for this run. But they don't advertise. I wonder how many people know of their services. The new North Shore service is a point in case. I've heard that it has flown but I haven't seen it on Flightaware. I think it was a shame they pulled out of Napier. With no Air New Zealand connection via Auckland there surely must be some traffic to Hamilton and/or Tauranga. And with the growth in Tauranga is there room for flights from there to Palmerston North or New Plymouth? Just wondering! Stewart Island Flights, Golden Bay Air, Air2there and Fly My Sky seem content with their niche services and there doesn't seem a lot of room for development of additional services. And of course then there is Jetstar... haven't heard a lot but I have hasn't spoken of high load factors. One wonders! Well this should generate a bit of comment! Users of Air New Zealand's Kerikeri to Auckland services say they will be inconvenienced by a change to the flight schedule. Currently Auckland bound flights leave Kerikeri airport at 6.55am. 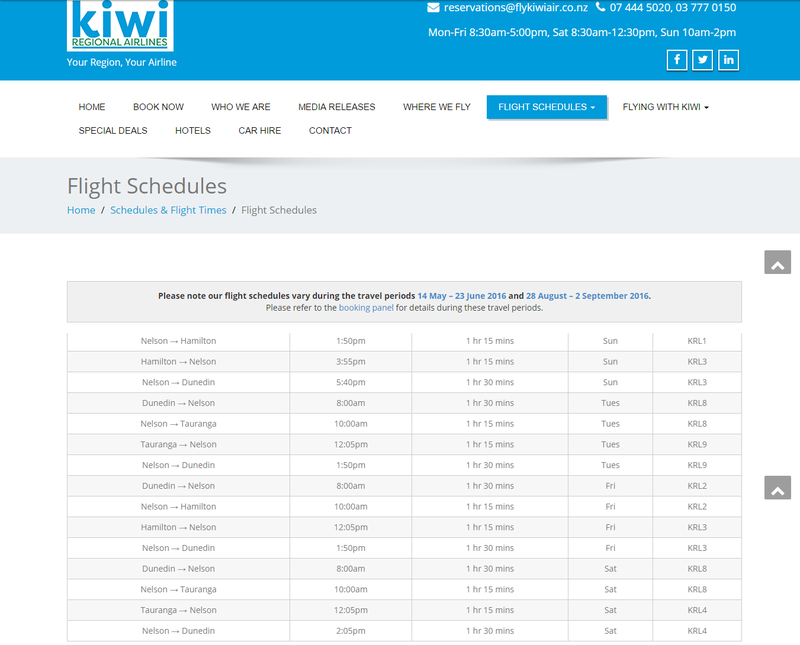 From October the earliest flight out of Kerikeri will depart at 9.10am. Dr Robin MacDiarmid flies to Auckland frequently on the early service. "It's particularly helpful to get to a 9am Auckland meeting or onto meetings in Blenheim," he says. "This later flight is going to obliterate those two possibilities." Green Party MP David Clendon says the early departure time allows users to be in the CBD by 8.30am. With the later flight you would be lucky to get into the city by 10.30am and a good chunk of the business day would be gone, he says. "I would like to see a bit more commitment from our national airline, reducing our connectivity will impact our economic growth. "This service was always well patronised, mostly by business people and you could be ready for a whole day of business." An Air New Zealand spokesperson says the airline has analysed the flow of passengers to ensure they provide the best possible connectivity to, from and through Auckland for customers in Kerikeri. "While we acknowledge the new schedule may not meet the needs of every customer, our analysis shows the majority of passengers on the Auckland - Kerikeri route only travel as far as Auckland." They note that the airline has not cancelled any services, but rather have made amendments to the departure times. Clendon says more people will have to bear the cost of travelling the night before and booking accommodation. A Facebook page: AIR NZ - Save the Kerikeri 6.50am Flight has been launched. Meanwhile, Barrier Air Services will continue with its scheduled early morning flights to Auckland from Kaitaia. Chief Operating Officer Nick Pearson says the company is no longer receiving financial assistance from Far North Holdings to run its Kaitaia services and has recently added more flights to its schedule. Making its debut flight to the Chatham Islands yesterday was their Rockwell 690A Turbo Commander ZK-PVB (c/n 11321). The Commander flew down from Hastings' Bridge Pa airport. As to what it will be used for the company's Facebook page says, "Nothing confirmed, but keen to have an island based air ambulance." ZK-PVB at the Chatham Islands' airport on 14 May 2016. Photo stolen from the Air Chathams Facebook page. The first time I've photographed for ages... any ideas as to what it is? Following on yesterday's post on my Sunair flight to Gisborne, as we were flying across on EVP it struck me that it had served the East Coast for a long time. Piper PA23-250 Aztec F ZK-EVP (c/n 27-8054053) was imported by Cookson Air in 1980 to operate their services Napier-Wairoa-Gisborne services. These routes were for a time extended to include Palmerston North and the company also operated a Wairoa-Auckland service. The Aztec operated with Cookson Air until the company closed in 1995. In October 1999 Air Freight NZ Ltd took over Vincent Aviation’s courier operation from Palmerston North to Napier, Wairoa and Gisborne using Piper Pa23-250 Aztecs ZK-DGS, ZK-EVP and ZK-FMU. 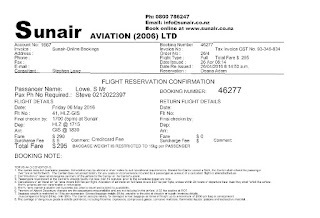 Air Freight it service ended in 2002 and EVP was sold to Sunair. ZK-EVP at Gisborne on 9 February 2001 while operating for Air Freight (NZ) Ltd.